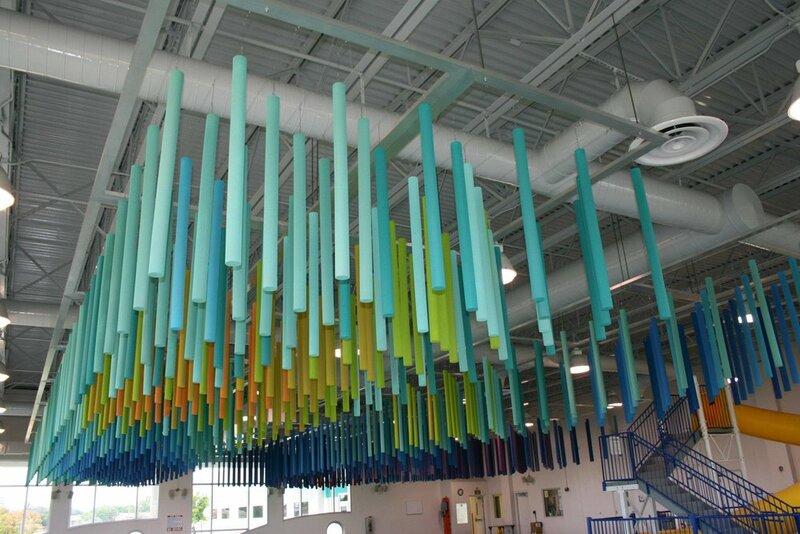 Xavier Cortada, “Splash!,” 972 hand-painted melamine tubes suspended from aluminum grids on ceiling of an indoor swimming pool. In creating Splash! 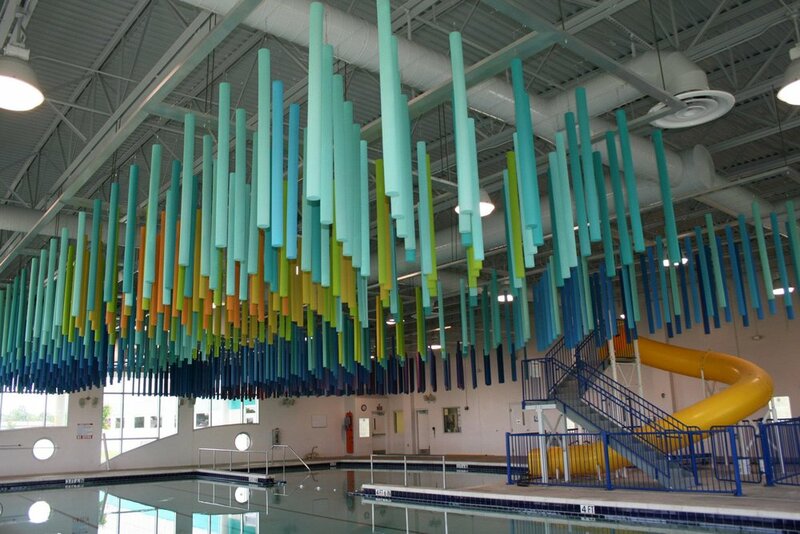 Artist Xavier Cortada, founding director of the Office of Engaged Teaching, Scholarship, and Creative Activities at Florida International University, collaborated with Colby Leider, Director of Music Engineering Technology at University of Miami, Frost School of Music to visualize resonant frequencies about the existing indoor swimming pool; charted shapes of calculated waveform results depicted a literal splash. 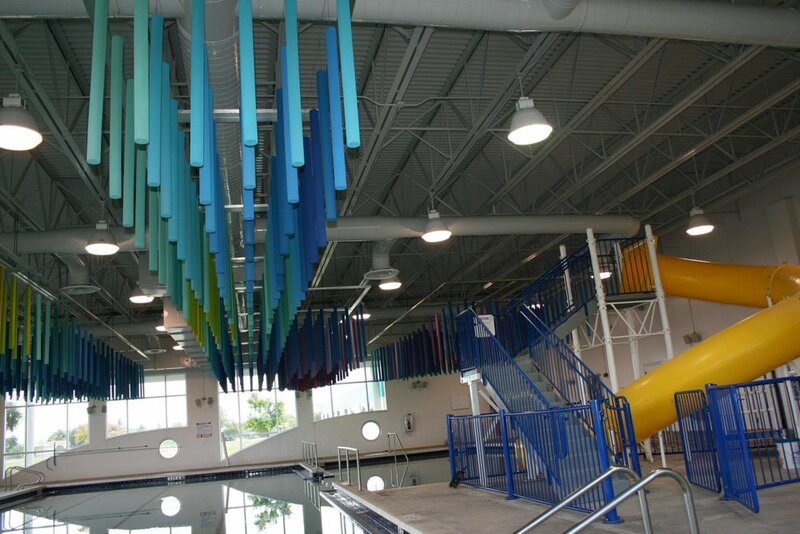 Anthony Antonelli, Architectural Products and Projects Manager along with Eric Johnson, East Coast Sales Manager of Pinta Acoustic Inc., Minneapolis, MN helped coordinate the custom production and sale of 972 (3” diameter x 48” length) SONEX® RONDO Baffles to be suspended as ‘pool noodles’ above the pool with Xavier. SONEX® RONDO Baffles are made from light-weight, Class A fire-rated, expanded melamine foam; a fiber-free material that offers excellent sound absorption across all frequencies. 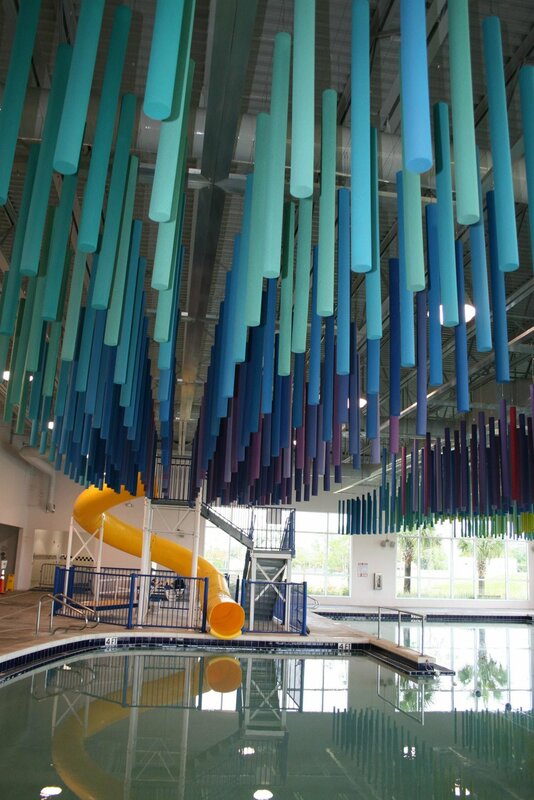 Ryan Reznichek of All American Builders Inc., Fort Lauderdale, FL figured and constructed the aluminum frame, ‘stainless steel’ stretched cable suspension system above the swimming pool to support Xavier’s multi-colored vision and meet Colby’s requirements for ‘acoustic’ pool noodles to be precisely located and individually suspended at various heights in order to deliver the three-dimensional sound wave effect as planned. "Splash!" is ultimately about fun, it also challenges viewers to think about physics. 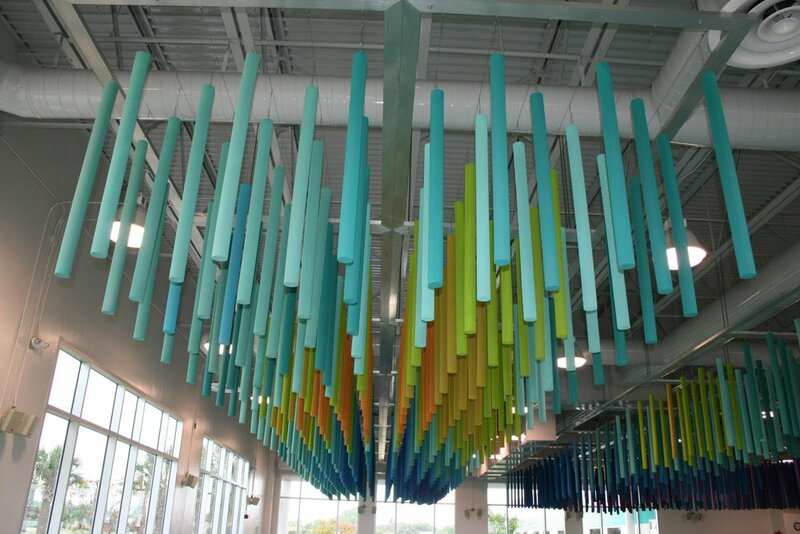 Through its placement in the space, the art helps viewers "visualize” sound as they are splashing in the water.